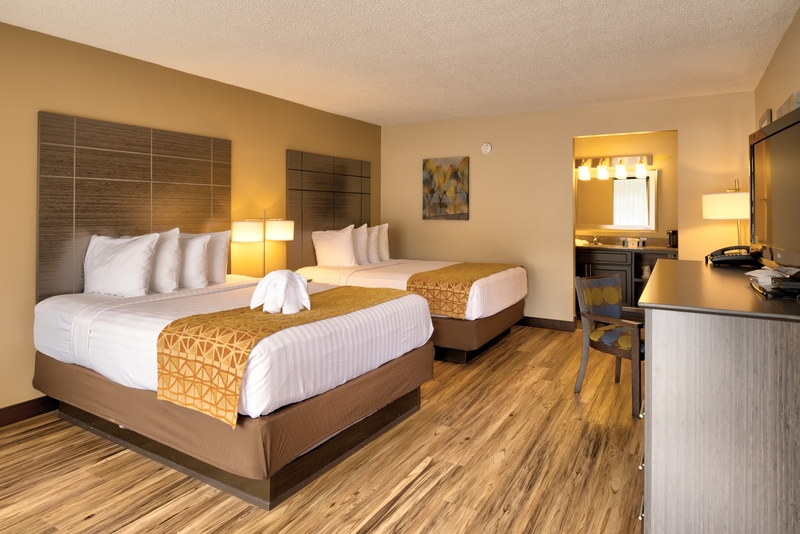 The BEST WESTERN Toni Inn is located in the heart of “Action Packed” Pigeon Forge, Tennessee, and we offer the area’s best in convenience and service. 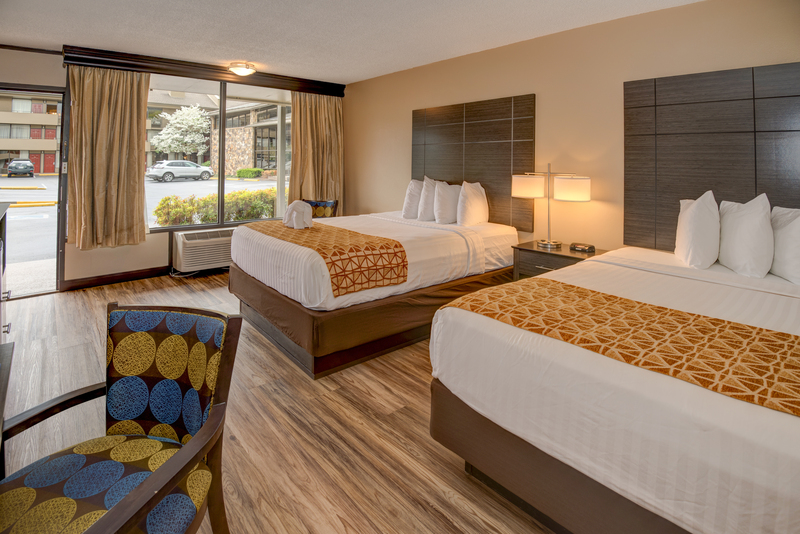 The hotel itself is conveniently located directly across the street from Dolly Parton's Stampede Dinner Theatre and just a stone’s throw away from Dollywood Lane. 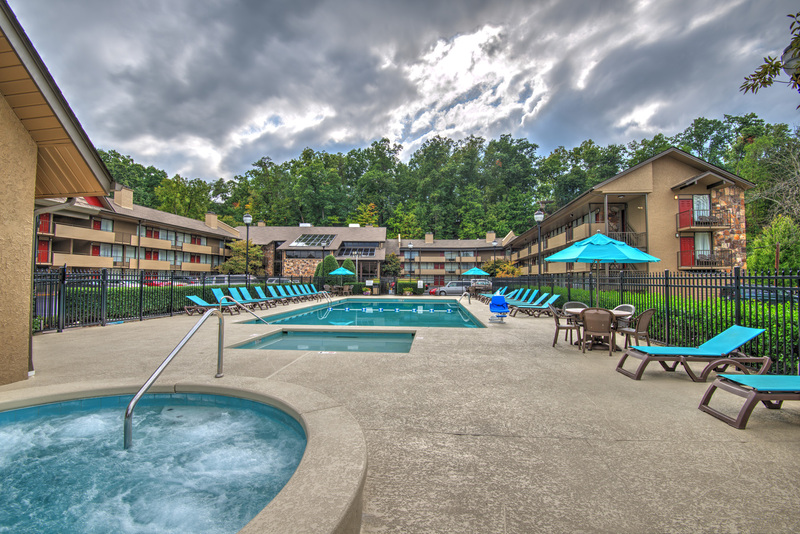 We offer a FREE HOT BREAKFAST, Indoor and Outdoor Pool, and have a front door trolley stop, so what are you waiting for, make your reservations today!! 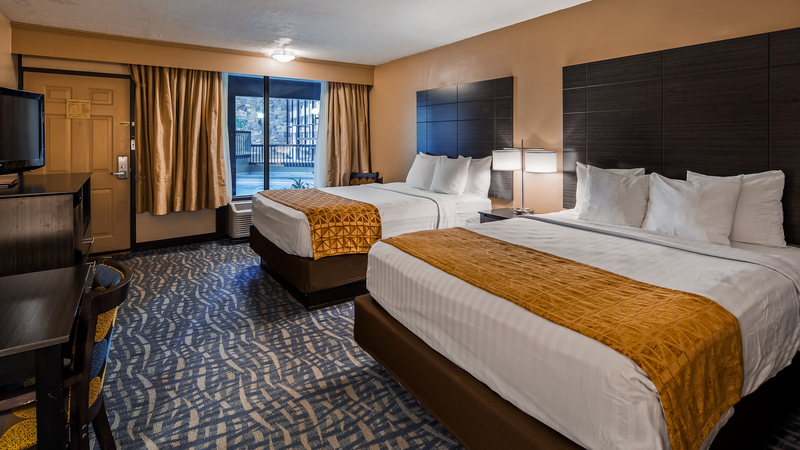 If you are looking for a clean and comfortable room for your family to rest your head, look no further, our standard room with 2 queen size beds has exactly what you need. 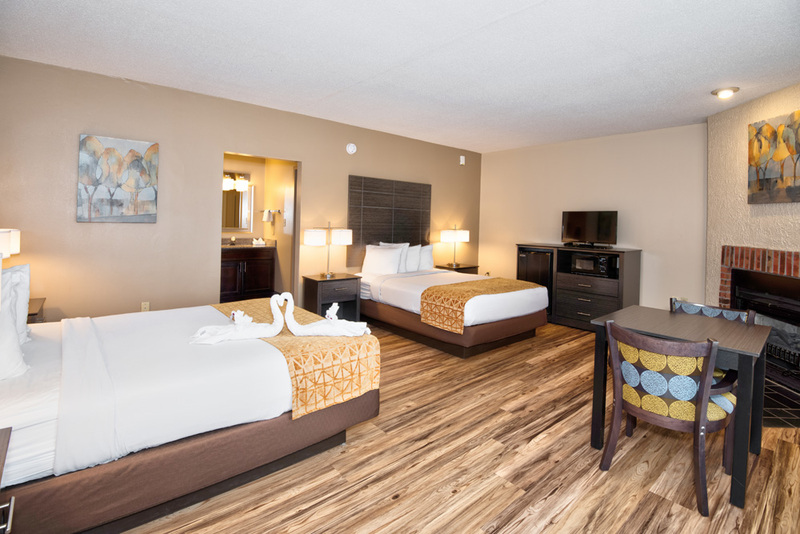 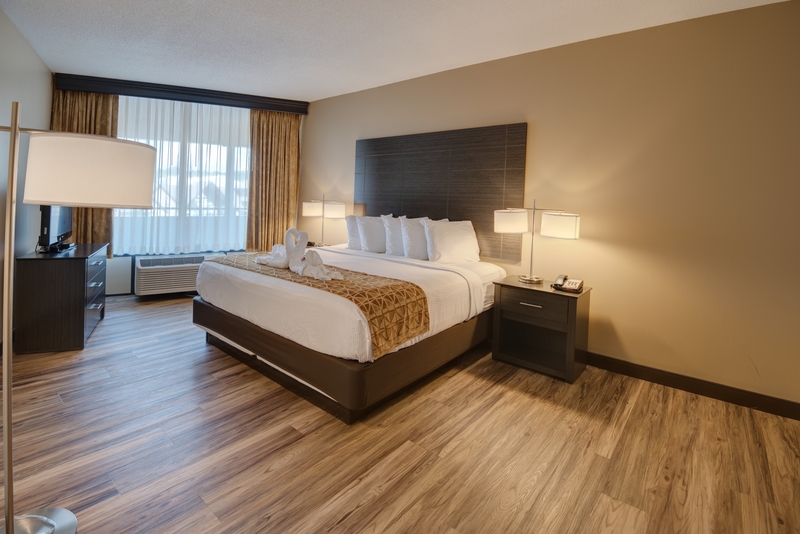 With all of the comforts that the BEST WESTERN Toni Inn has to offer, this room is perfect for families, business trips, group trips, or simple getaways. 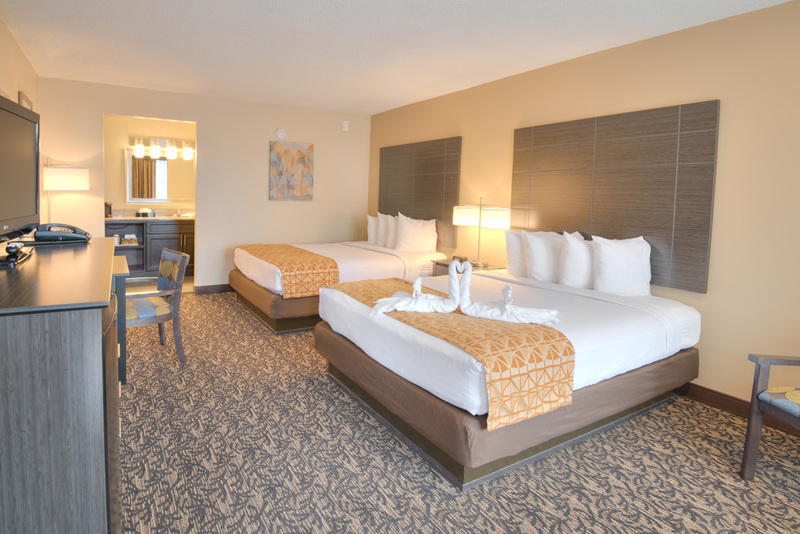 This style of room offers everything that our standard rooms offer with one added feature: ground floor access. 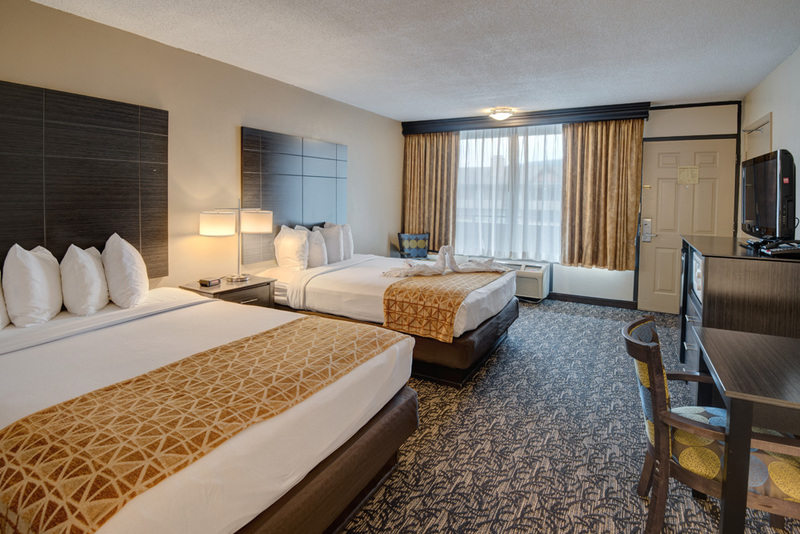 So if you prefer to avoid the elevator, staircase or walkways, and prefer direct entrance into your room, this room is what you are looking for. 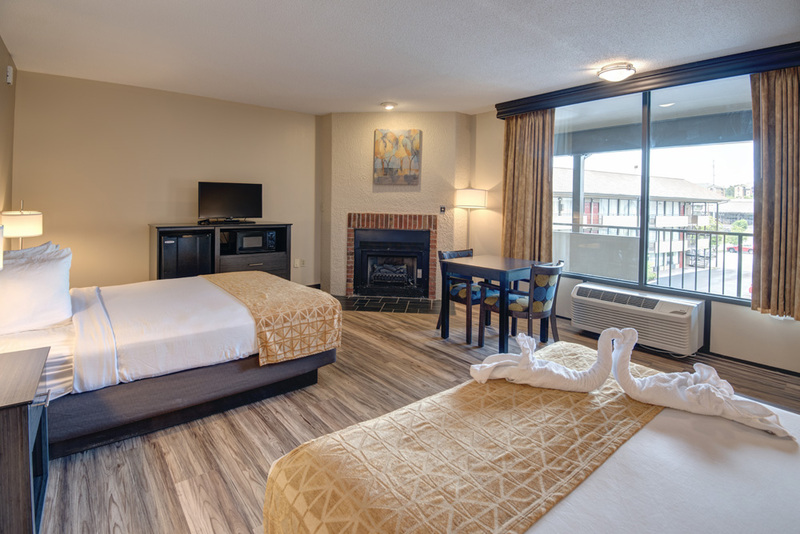 Although all of our rooms have the right to use the indoor pool area, only this style of room is located in our atrium area with interior access to our indoor pool. 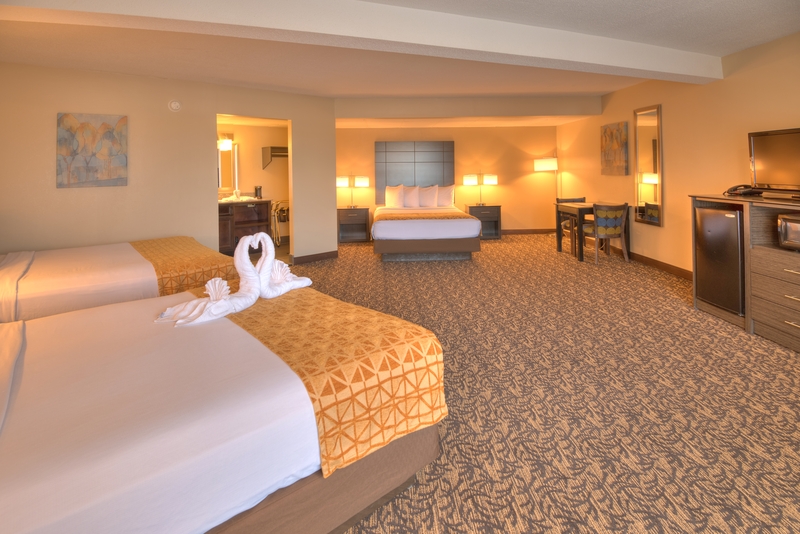 These rooms offer everything that the standard rooms offer, but have the privilege of being located right by the pool itself. 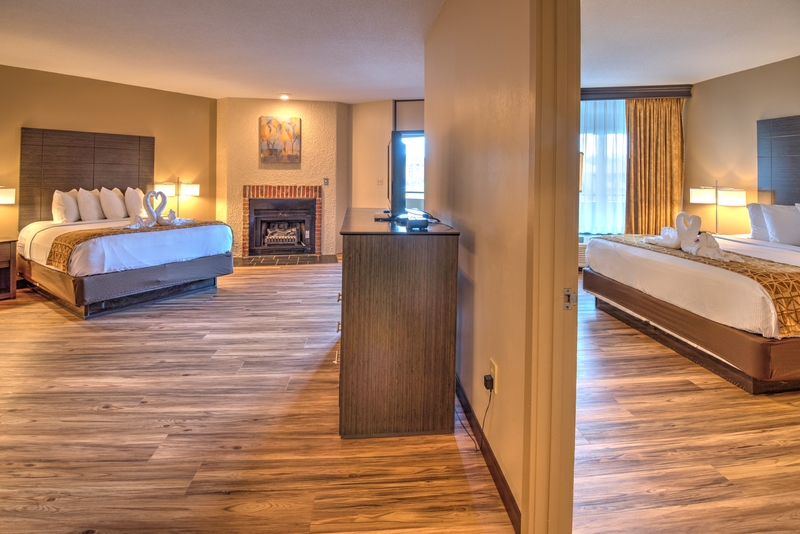 This standard room is perfect for the couple getting away for a quick retreat. 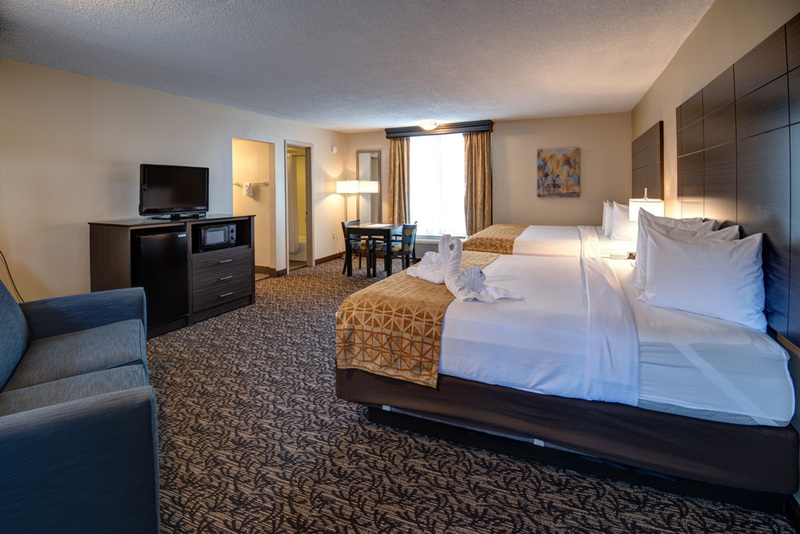 It has a king size bed and electric fireplace that gives it a little something special for creating that perfect Smoky Mountain memory. 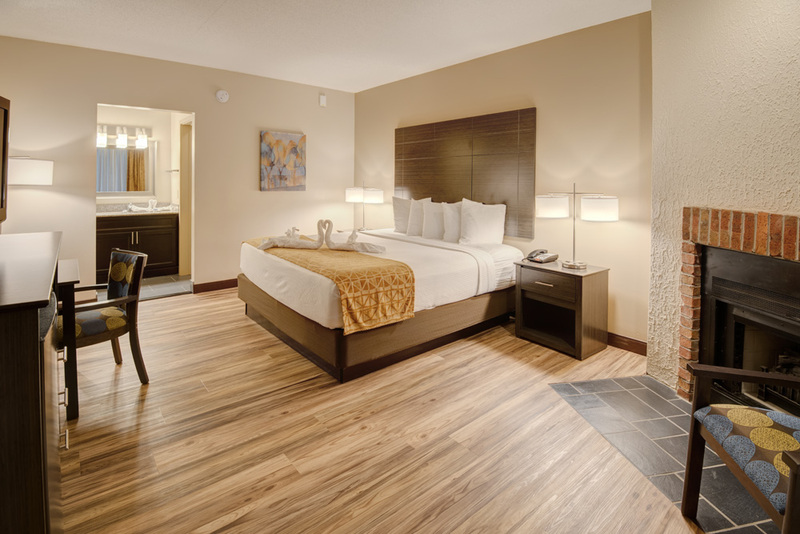 Whether you are getting away for a romantic couples retreat, or simply wanting a little extra relaxation, this room was built for you. 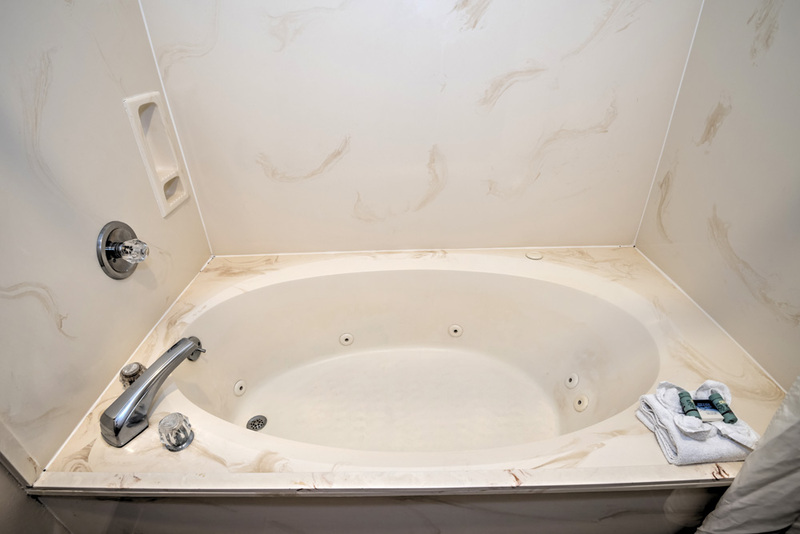 Our king whirlpool suite comes with a king size bed, 2 person whirlpool tub, electric fireplace and enough comfort and convenience to relax anyone. 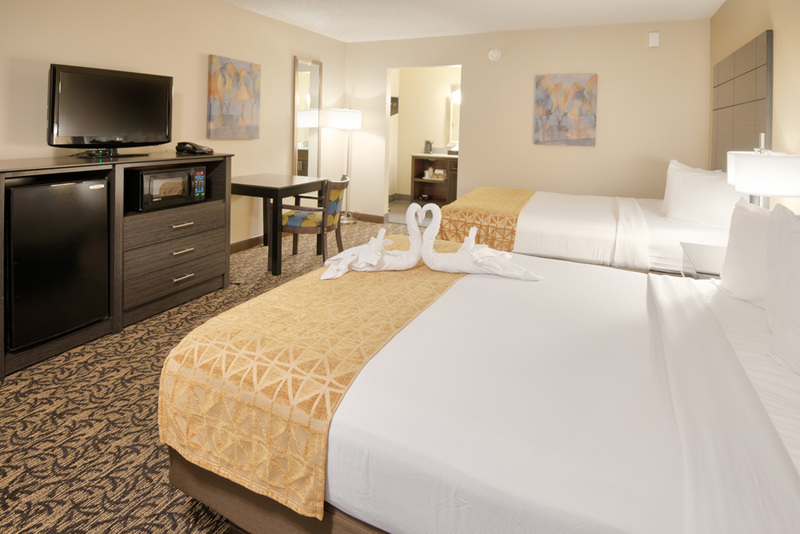 Bringing the family but still want a little extra, here is your room. 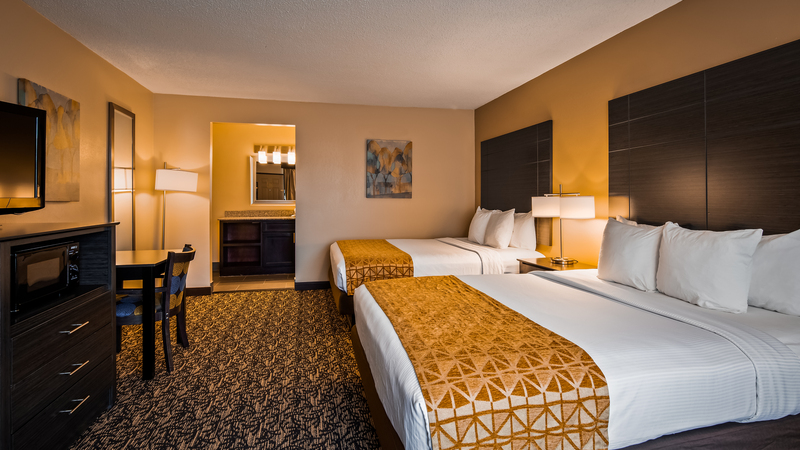 This room is larger than our standard room and comes with a few extra amenities to take the edge off the stress in your life. 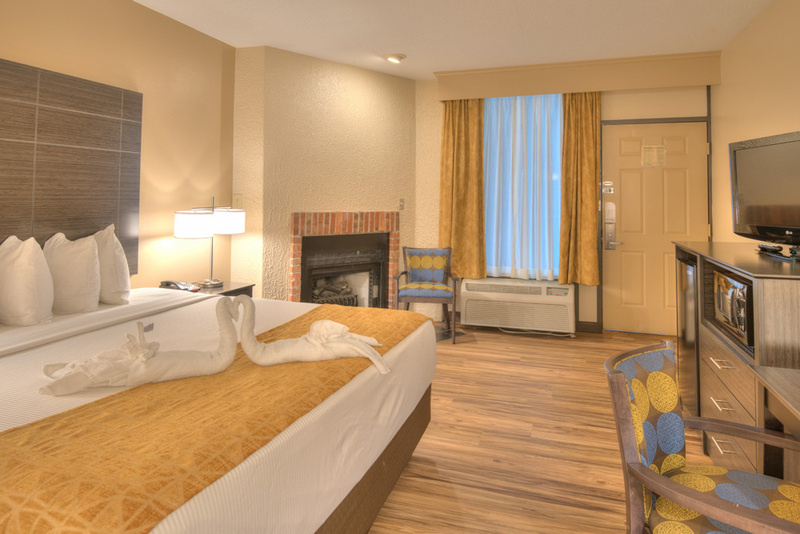 This room has 2 queen size beds, 2 person whirlpool tub, electric fireplace, and all of the comfort and convenience that the BEST WESTERN Toni Inn has to offer. 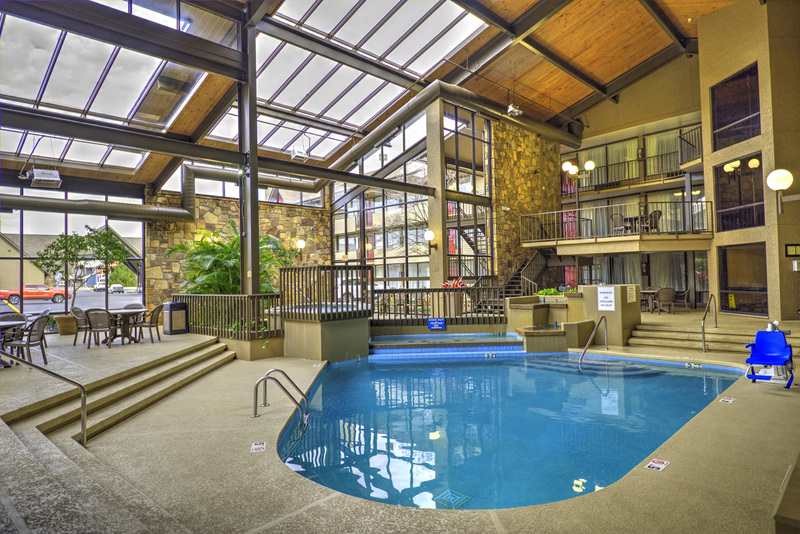 ​Are you looking for that extra special Smoky Mountain Moment? 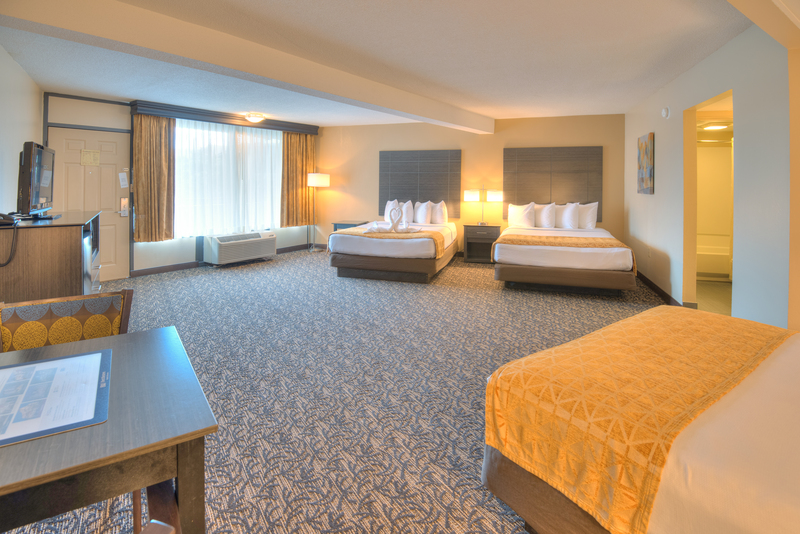 Get ready because this room is ready to give it to you. 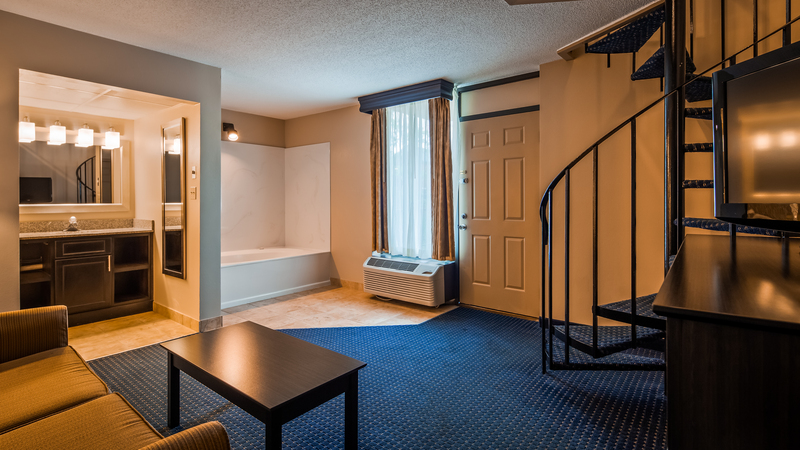 Our townhouse suite is a two story unit with a spiral staircase, 2 private balconies, in room whirlpool tub, and everything else you are looking for to create that memorable moment that will last a lifetime. 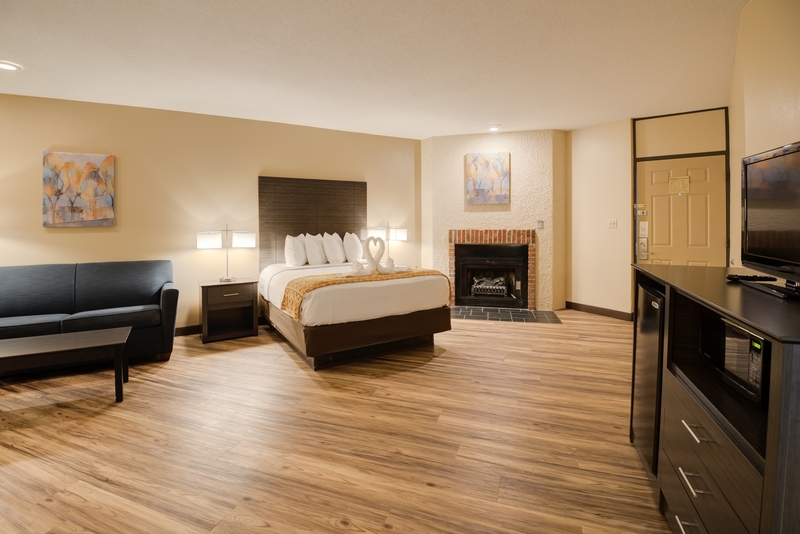 If you are looking for something a little bigger and more comfortable than a standard room, this is the room for you. 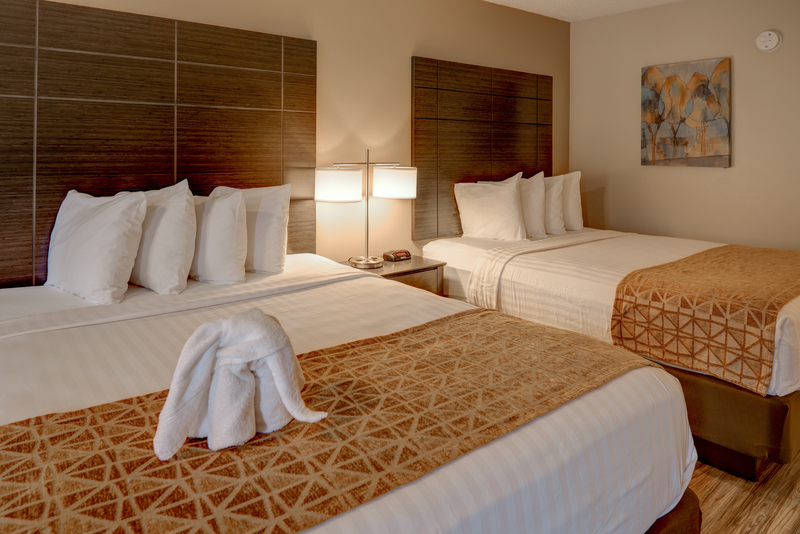 This room has a larger living space, 2 king size beds, sleeper sofa, and all of the comforts and amenities our guest have come to expect. 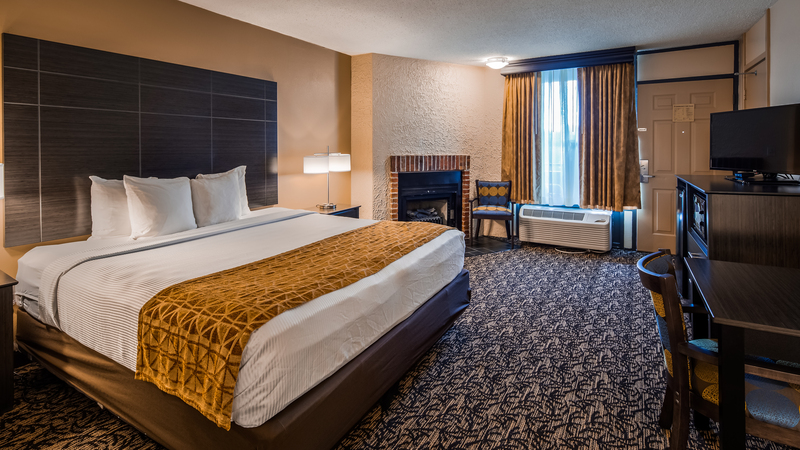 Bringing a few extra people and looking for a little more comfort? 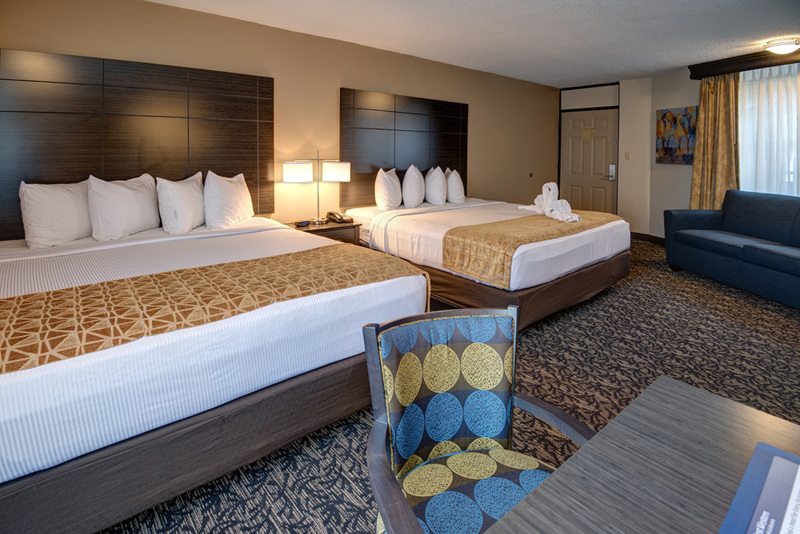 This oversized room features three queen size beds and enough room for your entire family. 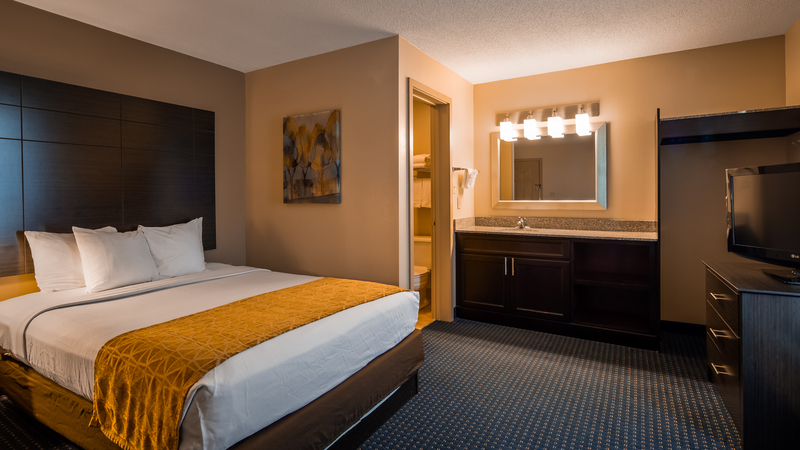 Add that to the comfort and convenience the BEST WESTERN Toni Inn gives to all of our guests, and there is no better fit for your family. 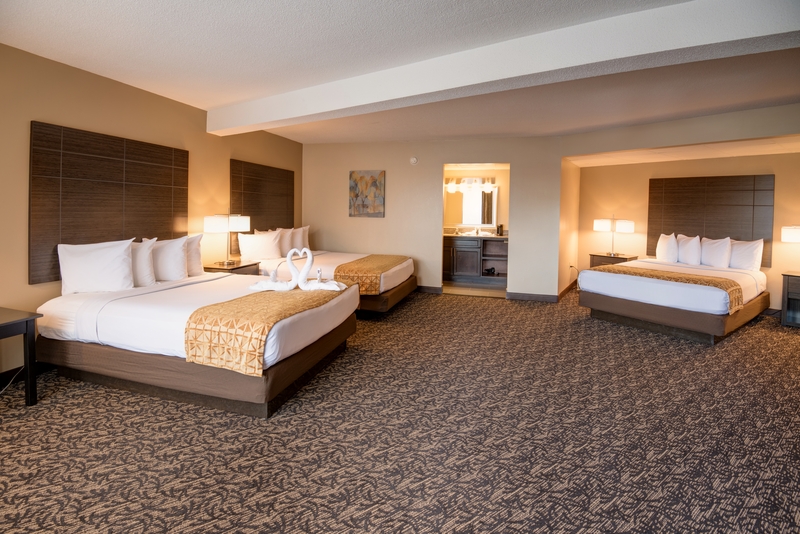 If you want the convenience of staying in the same room with your family, but still want a private space for yourself, this room is for you. 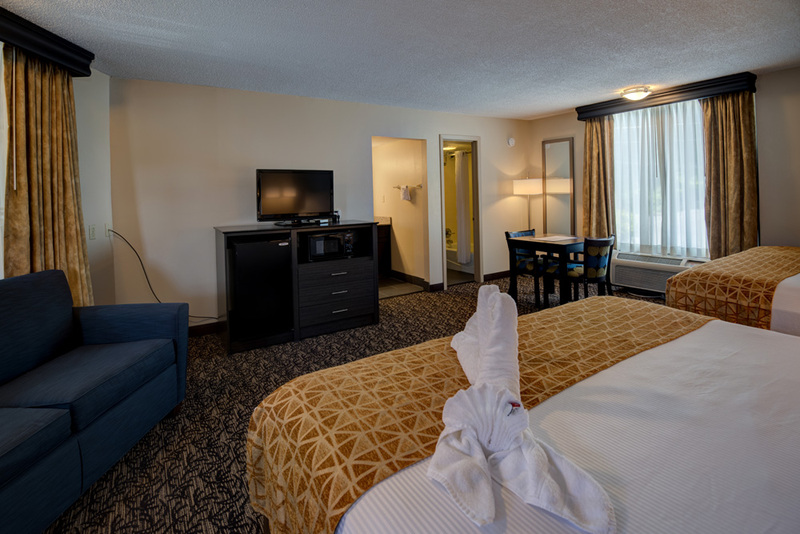 This two bedroom family suite offers an oversized room with a queen size bed and sleeper sofa, and also has a private bedroom with a king size bed.